Myanmar is truly one of the most enchanting places in the world that you can tour. With its rich culture and heritage, it is guaranteed that you will never run out of things to discover and explore in the country. If you ever have it in your heart to go to Myanmar, include Kyaiktiyo to the destinations that you are planning to visit. 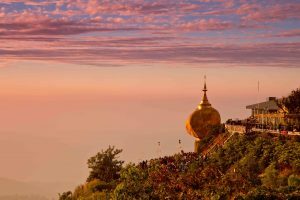 Kyaiktiyo Pagoda, also called the “Golden Rock,” is located in Kyaiktiyo, a tiny town around 160km from Yangon in the southeastern part of the country. It is a world-renowned pilgrimage site for Buddhists in Mon State. The pagoda stands around 7.3 meters (24 ft.) and perched atop a granite boulder encrusted with gold leaves. Legends have it that the Golden Rock rests on a hair strand of the Buddha and this maintains the balance of the rock, giving the impression that it defies the pull of gravity. Locals claim that the Kyaiktiyo Pagoda is the third most valuable pilgrimage site in Myanmar after Shwedagon and Mahamuni Payas. Getting to Kyaiktiyo is easy with the help of “Win Express” buses starting from the Highway Bus Station, also known as Aung Mindalar Bus Station. These buses will take you from the country’s capital to Kinpun and Kyaiktiyo. There are also pick-up trucks that could bring you all the way to Kinpun so that you can see the magnificent Golden Rock on your way there. The first trip usually leaves at exactly 6:30 a.m. and the buses travel at hourly intervals up to 2:30 p.m. You will pay 8,000K for the fare and the journey usually lasts for about 5 hours. Tourists get from Kinpun to Golden Rock by riding on a truck and/or by walking. The trucks can accommodate 35 to 40 passengers and won’t leave until they’re filled. If you want to bring your backpack with you, they have metal cages at the back for storage. You have to pay 1,500K for the ride from the basecamp and additional 2,500K to get to the top. However, truck drivers sometimes don’t allow tourists to go to the top of the pagoda because of the “sherpas” or the people working on the mountain. You can pay a porter to carry your things for 6,000K. On the other hand, you can walk to the zenith in a 5-hour steep trek. Peak season in Golden Rock is from November to March. 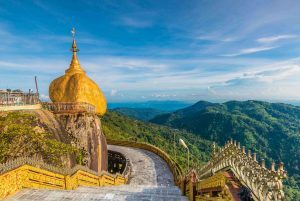 A gold-painted boulder that seems to balance on the edge of a cliff is indeed a mystifying sight to see, and so millions of people visit the Kyaiktiyo Pagoda every year to get a glimpse of such spectacle. The golden sunset also makes a perfect background for picture-taking with your family or with the monks. Admission fee is $6 and there’s no camera fee so bring your gadget and capture scenes to your heart’s contentment. Expect locals to approach and take pictures with you especially if you have a fair complexion. It is important to know that women aren’t allowed to touch the rock because of the Burmese culture. They are also not allowed to touch the monks as a sign of respect for the religion. Visitors are advised to wear comfortable, appropriate and modest clothes and footwear. If you love capturing the setting of the sun and you appreciate Burmese culture very much, Kyaiktiyo Pagoda offers the merging of these two, making it an ideal place to spend your vacation.